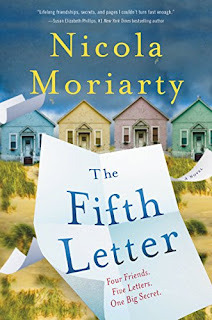 I’ve been sick today, and the only good thing about it is that I was able to read the newest book by Nicola Moriarty, The Fifth Letter. This book is getting a lot of attention, not simply because the author is the sister of the best-selling author, Liane Moriarty, but also because the book has earned attention for its own merits. The book focuses on female friendships and secrets – something most women can relate to. Whether or not their secrets are as “big” as the women in this novel, women tend to understand there are some things you keep secret, even from your closest friends. The book’s basic premise involves four decade long friends on a girls getaway deciding to share anonymous letters sharing secrets they have never told each other. Interesting premise as it is. But, there is more. The secrets are scandalous, and as they are read aloud, the letters have the potential to cause the fault lines in their relationships to become irreparable. But, again, it does not stop there. One of the women finds a hidden fifth letter (hence the title) that basically confesses to hating one of the women so much that she dreams of violently harming her. The main narrator, Joni, makes it her mission to restore their friendships and find out who the author of the fifth letter could be. Between confessional psychoanalysis and silly girl talk, this novel covers the usual gamut of toxic friendships, fertility issues, divorce and adultery. It does focus on women’s issues, and at some points, sounds like things you may have read before. However, the book quickly picks up speed and veers off into its course at the second half. Readers will be interested to find out whose secrets belong to which women and how/if these relationships can ever be the same. I imagine this will be a hit for the summer beach reads and will garner plenty of book discussions. My main complaint is that this is another book that I struggled with liking any of the main characters. This is a personal opinion, but I feel like it is a new trend in fiction – make characters unlikable. In a book about female friendships, there was not one character I would want to be friends with in real life. Again, with that complaint aside, I still found the book engaging. I will both recommend this novel to my friends and be thankful that my friends are not like these women.